"You pay to give it and not to get it!" 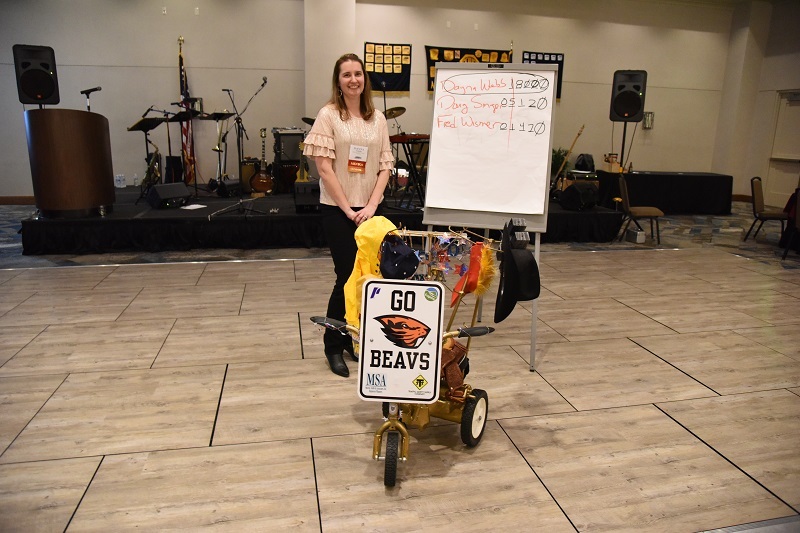 At the 1987 Spring Conference, Pat Napolitano, a past president (1985) presented to the then-President Hugh Kalani a big, rusty “hunk of iron” which was actually a part of a train-coupling mechanism that Pat had scrounged from the railroad yards near Hermiston. 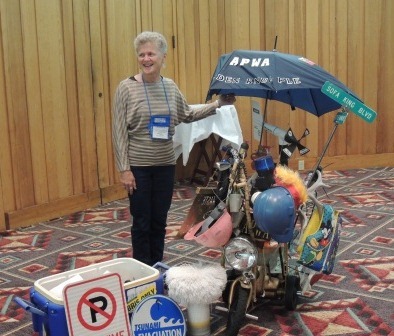 President Hugh embellished the award by adding steel wheels that came from an “antique” International truck. The award was later named the “Golden Knuckle Award,” but it is best known by its nickname – The Gizmo. 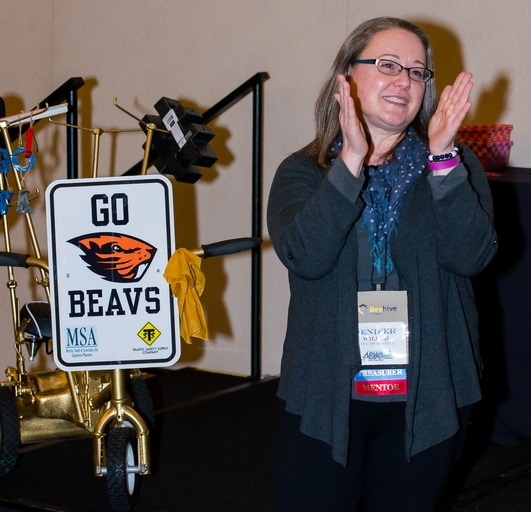 At every spring and fall conference, a “lucky” chapter member receives the Gizmo and adds his or her own embellishments to it. 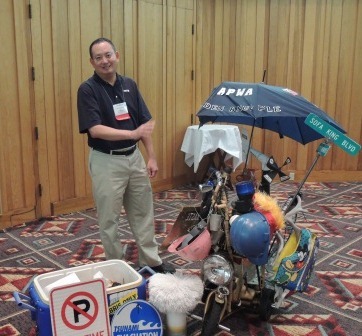 In 1993, Larry Rice, award recipient, requested that the chapter turn the award into a fundraiser for the Oregon APWA Education Foundation. Over the years it has raised more than $200,000 for scholarships. The list of “winners” reads like a Who’s Who of chapter history, and the embellishments catalog 30 years of culture and 60 versions of personal taste. At the center of the fundraiser concept is “you pay to give it and not to get it!” There is a minimum contribution of $10 (included in conference registration). You get “points” depending on the level of your contribution The more dollars, the more points. You apply the points to the name(s) of the person(s) you want to receive the award. The person with the most points at the end of the conference takes home the award. In the event of a tie, the immediate past recipient will make the winning determination. 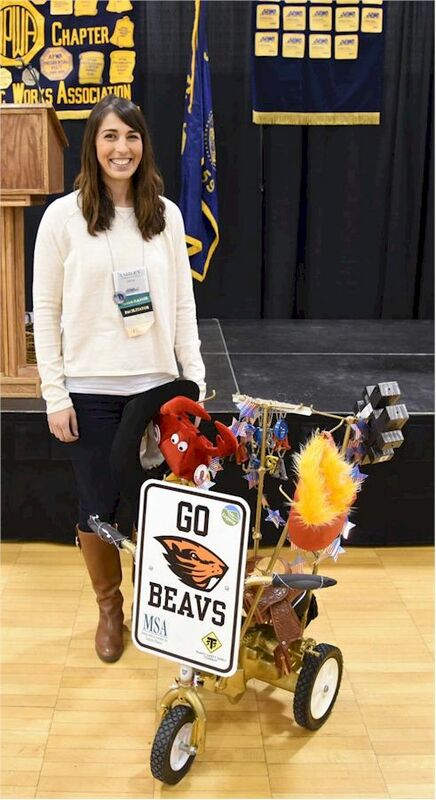 Fall 2014 Nikki Messenger Hashtag sign and metal letter hanging off a engineer's scale spelling out "Oregon APWA"